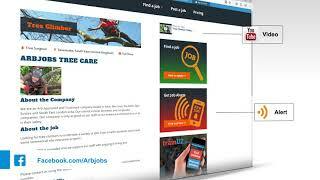 Find arboricultural staff or tree surgery staff with an arbjobs featured advert. Using Arbjobs makes sense established in 1999 we are one of the oldest and largest tree related jobs boards on the internet. Employers only pay for adverts there are no hidden fees or recruitment charges when using our jobs board service. We recommend reading our guide on how to write a good advert Each advert will be accessible to jobseekers searching on devices from smart phones to desktops. Only Featured adverts will have an enhanced appearance with your logo appearing alongside the advert summary. Featured adverts are also promoted to applicants via our social media network. To enhance this we ask clients to add Facebook photograph that will be shared out in to the industry helping promote that particular job. The photograph should idelally be 526x275 Pixels in size. We can help size this for you if you are having difficulties. If you have a corporate video on YouTube add the link to your advert and the film will become embedded in the advert content. This gives potential applicants a real feel for the company. You may even consider producing a film about what it is like working for your company and the oppotunities available for employees. You will have 24/7 access to your account allowing you to manage your adverts at times to suit your needs. In your account you can load a new job advert, view running advert stats, clone previous adverts and view invoices. Your advert will create an automated system Job Alert informing our registered applicants that a positon meeting their criteria has been loaded. Our messenger service ensures you never miss an application. Access your management area and messages whilst on the move via notebook or smartphone. You will recive an automated reminder informing you when your advert has expired.